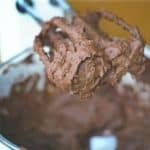 This Secret-Ingredient Chocolate Frosting is super healthy and is paleo, dairy free, sugar free, and deelish--great right off the spoon. Place sweet potato, coconut sugar, stevia, vanilla and salt in food processor and process to blend. Add the cacao powder and process until combined. Set aside. In a small, heavy-bottomed pot, combine the chocolate, cashew butter and coconut oil over low heat. Turn the mixture into the food processor and blend everything until smooth and creamy, scraping down sides as necessary.